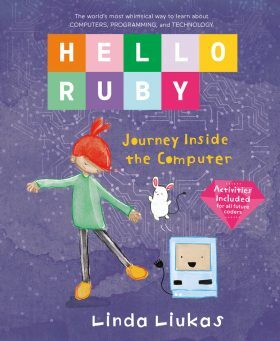 Ruby falls inside a computer and goes on an adventure to meet the components. Part storybook, part workbook, the book even includes a DIY paper computer. All while learning what a computer is, how it works and what kind of things it is good at. All important skills for a kid, who grows up in a world surrounded by computer. Ruby is bored. She goes to play with the computer, but the mouse doesn’t work. Ruby, and the mouse, decide to solve the problem. Ruby meets the bits, logic gates, computer hardware (CPU, GPU, RAM and Mass storage) as well as the operating system and various programs. Finally, they expertly troubleshoot the computer. But does the computer still work? A journey inside the machine that powers our world. The computers around us work tirelessly, but what if there was a way to peek inside? Where are the ones and zeros that the machine actually runs?